Everyone wants nasturtiums with flowers held above the foliage and 'Tip Top" is a standout. Marbled white and soft green foliage sets off the cherry red single blooms, an unusual and coveted shade among nasturtiums, which often tend toward scarlet tones. Provide nutrient poor soil for best show, as rich soils promote lush leaves at the expense of flowers. I love the 'Tip Tops', for they willingly show off their jaunty blossoms above lily-pad leaves for all to see and enjoy. Of easiest culture too, just avoid overly rich soils. Molten deep red blooms float above the yellow-green shield-shaped leaves, an artful combination, and unique among nasturtiums. 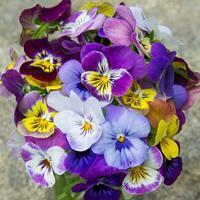 A flower arranger's delight, they also have spicy edible flowers and leaves that make a festive addition to salads. We all want top flowering nasturtiums that hold their brilliant silken parasols high above their sea-green foliage. ‘Tip Top’ Mix doesn’t disappoint. 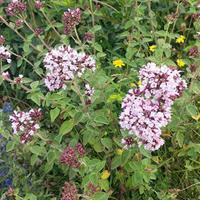 A cottage garden staple with edible flowers that is best in regular, not rich soils. A trailing variety to 6 feet long, this cream and green leafed variety is the perfect companion to our heirloom Indian Cress. Full color range, including unusual strawberry and bronze shades. One of many selections in Burpee's 1908 wholesale catalog, 'Vesuvius' has broad petals of salmon rose that are held above the leaves. One of our favorite nasturtiums, for the semi-double flowers face upward and above the compact foliage. Gorgeous summery colors of cherry, tangerine, scarlet, mahogany, lemon and cream. Easy to grow, and a delightful cut flower. 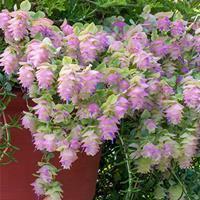 Trailing 'Kent Beauty' oregano's colorful bracts bloom perpetually as part of the 'Herbal Bouquet Collection'. Origanum rotundifolium x Origanum scabrum. 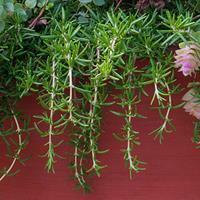 With a habit unlike other rosemary plants, this one gracefully spills from hanging baskets and also functions well as a ground cover, all while helping to deter unwanted insects. Deer-proof and great for low-maintenance and outdoor sitting areas, and easy to overwinter in containers when placed in a south-facing window--fresh herbs year-round! Named for the famous English horticulturalist E. A. Bowles, this Johnny-jump-up has eggplant purple little flowers with gold splashed centers that bloom spring to summer and again late into fall. It forms generous drifts from self sowing wherever it's happy. I for one can't be without it! A collection of all types of Viola x williamsii, or horned violet, including bicolored blooms in unusual colors and colorful velvets with little whiskered faces. Make sure you cover the seeds when you plant, as they need dark to germinate. Try your hand at growing the fragrant sweet violets of yore, Victorian era 'Queen Charlotte' deserves to be grown by the score, carpeting the springtime woodland garden, the dainty blossoms picked for culinary use or simple fragrant delight.